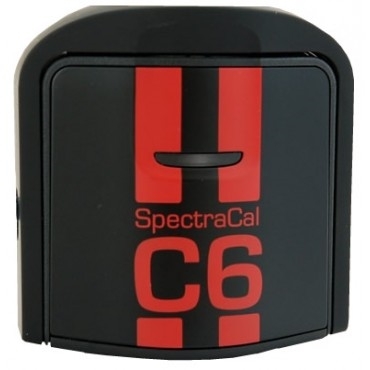 The SpectraCal C6 Colorimeter is one of the most advanced light measurement devices available, rivaling high-end spectroradiometers in speed and accuracy. The C6 colorimeter is field-upgradeable with CalMAN 5, meaning that the calibration tables and supported display technologies are automatically updated when the device connects with the software. Every C6 colorimeter sold is first certified in SpectraCal's calibration lab with a Konica Minolta CS-2000 and shipped with a NIST (National Institute of Standards and Technology) certificate of accuracy. Professional and DIY calibrators seeking highly accurate readings and excellent low-light handling. - Supports all display technologies, including plasma, LCD LED, front-projection and OLED. CalMAN also supports Windows® Vista™ or later in VMWare Fusion® and Bootcamp® for Mac OS X® users. The C6HDR works very well, I have more options to use and it reads fast.